It is with great sadness that I report the passing of my friend and colleague Tim Soxman, W3ZVT. Tim passed away on September 19th, 2009, after a long illness. He was a good friend, and he will be missed. 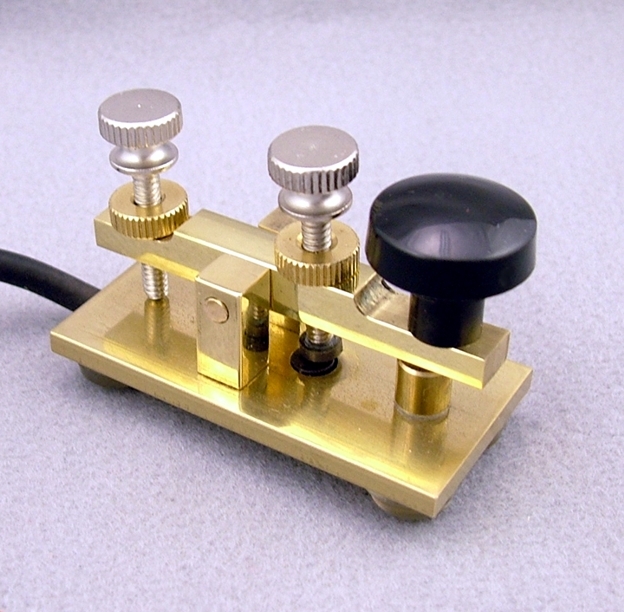 "Supporting the Art of Morse Code"
Morse Express presents the Sox Key, a hand-made miniature telegraph key perfect for portable operation. 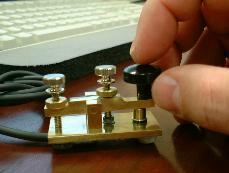 The Sox Key is made by Tim Soxman, W3ZVT. The Sox Key is a tiny delight to use. With the base and main parts machined from brass, it weighs in at a whopping 3 Ounces, including the cord. The base measures 1x 2" and the key stands 1.25" tall to the top of the knob. It's easily carried in pocket or purse, or you can even operate it hand-held! The attached cord is terminated in a 1/8" phone plug. Where's the spring? It doesn't have one! Tension is magnetic, and is fully adjustable via the screw just forward of the trunnion. The knob-over-base design insures that the key won't tip forward when in use, and in fact it has a very comfortable feel to it. use. Even my wife thinks it's cute! my other "mini key" (which is 3-4 time larger). If you are a user of the Sox Key, your comments could be here! Write to us via the link below, and please be sure to say specifically that we can use your comments on the web page.